Présentée ici la partie 2 en gros plan: ou, je suppose (mais Timo corrigera), quand le "savon" qui a permis de faire la bulle commence à "tomber" comme du mélange sable+eau entre 2 vitres. Le tout en laissant quand même la fine membrane d'eau qui garde sa cohésion. Close up of a thin film of soapy water that is vertically suspended across a 19 cm diameter plastic ring and illuminated with white light. Gravity pulls down on the film to make it much thinner in the top section of the ring than in the bottom section. Light reflecting from the front surface of the thin film is able to interfere with light reflecting off of the back, resulting in different reflected colors from different film thicknesses. For example, where the film thickness causes destructive interference for blue light but constructive interference for green and red, we perceive the color yellow from the reflection of white light. Eventually the film at the top of the ring becomes so thin that destructive interference occurs for most of the visible wavelengths, resulting in no reflection of visible light—the film is rendered completely transparent and all we see is the black background. Starting at about 1:12, the colors seen in the upper section of the ring are roughly what we would expect from a linearly increasing film thickness. Meanwhile in the lower section the thickness is changing in a more complicated way, and the colors appear washed out. 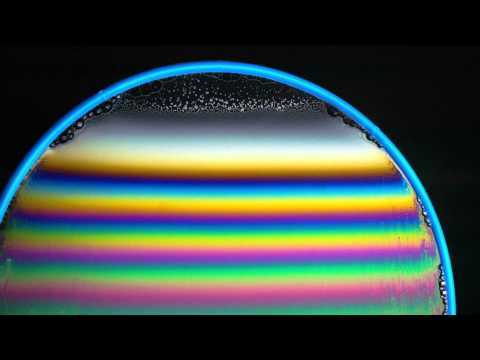 The soap film shown here consists of 2/3 cup of Dawn liquid dishwashing soap, 3 tablespoons of glycerol, and 1 gallon of water. We guess that the average index of refraction of the solution is close to that of water (about 1.33). The footage was taken July 16, 2014—the third consecutive day of rain and high humidity in Cambridge, MA. The light source is a portable fluorescent light box with a color temperature of between 4500 and 5000 Kelvin. The camera used is a Blackmagic Cinema MFT with a Vivitar Auto Wide Angle 35 mm lens. The footage was shot at 800 ASA in CinemaDNG RAW 2.5K and color corrected using DaVinci Resolve 10 Lite.